iKamin is the solution to address-related problems faced in Nigeria and many countries in Africa. It uses tablets and smartphones to encapsulate GPS coordinates into easily exchangeable/memorable short string code which is both immediate and free. The generated GPS coordinates wrapped-code is called KaminCode which represents a 9-alphanumerical unique and private location code, allowing for quick and accurate address. Technologies on which iKamin was built leverages on open technologies and latches on Google map services to provide views and direction. iKamin can work without an internet connection or mobile sim card. All you need is a location-enabled (GPS) phone that runs on android systems (iOS and Windows versions uder development at this time). 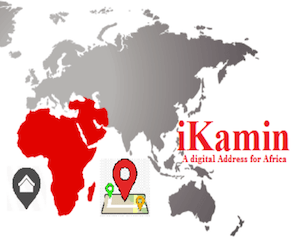 When KaminCode is generated, or KaminCode sent to one is used in “use code”, iKamin has the capacity of telling which city, which state/province and which country that address belongs to within Africa, it does so without going online. You can also get a direction from your present location to the address without asking or making unending phone calls. iKamin works in places that haven’t been mapped. It does not use country codes so works in disputed territories. Places that are close to each other have similar KaminCode. This makes it easy to work out areas closer to each other. Views can be screenshotted and printed as a grid on paper, posters, and signs when viewed on the map. This makes them useful also for people without access to mobile phones. Like normal house address, people decide who they want to share their codes with. iKamin is dependable. Issues of database crashes etc. is completely voided. Issues associated with DATA AND SECURITY does not arise. iKamin does not store anyone’s code in any database. It hashes latitude and longitude of places and decodes them within the app. This was done to void warehousing of people’s data which may lead to malicious acts. It is short enough to be remembered and used. It is a 9-alphanumerical string. It has enough information on its own. Extra information (such as street number, locality or country name) could be helpful, but is not be required to locate a place. Has precision of about 4.8m x 4.8m area. iKamin is culturally independent: The symbols that make up KaminCodes are widely available and recognizable and avoids including profanity or other words in multiple languages. It can function offline:The code can be generated in both built-up and rural areas, so can be created and decoded without a data network. Use of iKamin requires no license fee or restrictions. Just to say that it is easy to identify areas close to each other! street addresses are either poorly demarcated or non-existent. As a result, homes and buildings either do not have street addresses or have addresses that cannot be precisely located without specific local knowledge. streets that are unnamed or have been renamed a few times. unofficial roadways or settlements (like the slums in Kibera in Kenya, the Makoko area in Lagos etc). newly constructed streets whose names are not widely known. areas that have the same or similarly named streets in close proximity. locally used names of streets that differ from the official names which could be completely different names or abbreviations of the official names. unusual orderings of building numbers – non-consecutive or not aligned with the street. This non- regularized/ definitive address comes with many challenges without which many modern societal needs barely function; such as being unable to receive deliveries, direct emergency services, or manage disaster relief. In the past, solving these problems required naming streets and numbering houses, but for even a small area this can take years and cost significant amounts of money. There exist occasions where street addresses are not useful, even where they are available, an example is locations inside parks which may be hundreds of meters away from the nearest address. Even for buildings that do have unique addresses, there is no practical way, for example, to specify the location of different entrances. This particularly affects large entities like factories, hospitals and sporting facilities. Shopping malls also typically have a single address, but may have several entrances in addition to each shop having its own location. It would still be useful for things like fountains, machines etc. to be able to have their locations referred to. NOTHING EVER IS PERFECT. iKamin has its own challenges! User phone’s GPS receiver design features/quality. The position of the satellites at the time KaminCode was been generated. The characteristics of the surrounding landscape; thick forests, underground/indoor use or signal jammed sites can make GPS signals unconditionally weak or not being able to be received. Signals reflected off buildings or walls or bridges (“multipath”). On rare occasions, magnetic fields generated by the sun causing solar flares, or emission of intense radio waves from a star (radio burst) may result in reduced GPS signal reception. Some atmospheric conditions like rain or snow can weaken the GPS signal but they generally do not affect GPS reception. Ideally, rains do not affect GPS reception, but heavy clouds, eventual thick fogs or snow could be a hindrance for the signals to reach GPS receiver, leading to weak GPS signal. This is same for TV signals going off on a heavily clouded day with thunderstorms. Some have proposed that it is also possible that when battery operated GPS devices are cold, due to weather conditions, they will emit less power resulting in signal degradation. iKamin is coming to stay. It is for EVERYONE; individuals, emergency-response outfits, e-commerce-oriented establishments, Banks, Companies. this list is endless. Imagine a world where people would ask “please KaminCode me your address”. Like Handshake, you cannot have an address and your users do not have the app to use it. The point? This app, like our phones, cannot exist without everyone having the need to own it and relate. Many other features are still in the pipeline. iKamin Targets Every Smart Phone User in AFRICA!! !